The new pH waterproof analyser series HI 99131 is created for galvanic treatments. The pH waterproof analyser determines the acid content in the plating baths of plated and produced residual water. 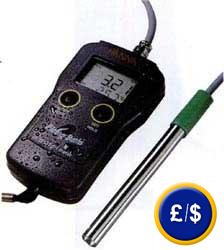 The electrode of the pH analyser has a stainless steel layer with a contact flat sensor. The layer of the electrode serves also as earth. The contact surface operates with a PTFE diaphragm in the shape of a ring to guarantee a stability of measurement and a faster response time. In the electrode there is an integrated sensor of temperature to measure the temperature and for the automatic compensation of the temperature. In case of possible environmental disturbances, the measurement signal is used through the integral amplifier. The pH analyser is mainly used in investigation and development. The pH measurement is one of the most important criterias in the galvanic process to reach and guarantee the greater quality in the galvanic treatment. 0 ... 50 °C and 100 % R.H.
- Calibration set (pH 4 and 7). - Spare electrode (HI 62911).